Note, you can substitute cashew nut butter for cashews and get the same creamy result. I recently purchased a pound of raw, organic cashews from the bulk section at Whole Foods for my homemade trail mix, but so far most of them have gone into my smoothies this week. They can be addictively good! Place all of the ingredients into your blender and blend on high until the desired consistency is reached, usually around for 30-45 seconds. If you try this creamy cashew smoothie please leave a comment below and tell me all about it. Happy Blending! Thank you for posting this recipe. I just made the smoothie. It was delicious. This was my first time using cashews in a smoothie and it worked really well in my vitamix. I wanted to add protein without using any protein powder. I didn’t use any milk – just juice and ice along with fresh strawberries and banana and it was delicious. Awesome, Carol! That sounds delicious. 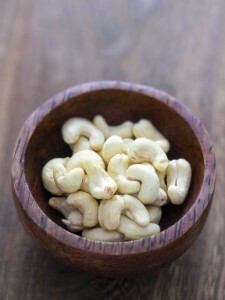 Cashews and most nuts blend well in high end blenders like the Vitamix. Cheers! Just tried this. It was quick, easy and delicious. Thanks! Good deal, great to hear you enjoyed this smoothie! LOVED IT! Tried it with coconut flakes, and it was AWESOME! Thanks for sharing! My pleasure, Kecia. Coconut flakes were a nice add-on. Cheers! Absolutely delicious! I used brown rice milk and added a teaspoon of smooth peanut butter and a teaspoon of desiccated coconut too. Nutty and fabulous! Added a bit of agave nectar and forgot the salt darn it! Some ice also. Very nice! It was delicious. Thank you. It came out absolutely amazing. I think I’ve found my new morning smoothie! Salted cashew butter, nice! You might want to add a little cayenne pepper to prevent downing in 2 minutes :) Great to hear how much you enjoyed this. This was awesome! I went with the coconut oil option and added a little bit of nutmeg and honey. Nice and filling! I just made the smoothie. I used 1/4 cup soaked cashews. 1 teaspoon of vanilla and added about 6 ice cubes as I like my smoothies cold and my banana wasn’t frozen. Was Deeelicious! Without the banana and with a dash of vanilla it worked wonders! I used every ingredient except the salt & used unsweetened vanilla almond milk. Also added half cup of raw spinach & results were amazing!! Really good smoothie! Nice tweaks to my recipe, Rosa. Great to hear you enjoyed it! We made this last night, regular recipe plus the shredded coconut and two ice cubes (since our banana wasn’t frozen). Great taste, I think next time we will try the berry add-on. Thanks! You’re welcome, Tara! You rarely go wrong with adding berries. Used frozen mixed berries. very creamy. loved it.